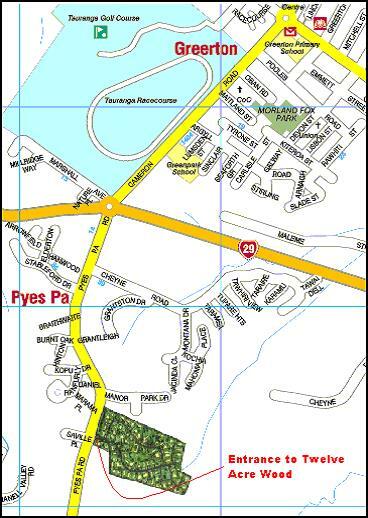 1 km up Pyes Pa Road, Tauranga, in a popular part of Tauranga City - refer map. 2 km from Greerton Village - shops, banks, Post Shop, library. 3 km from Gate Pa - Mitre 10 Megastore, New World, shops. 10 minutes to CBD via Route K tollway. Pyes Pa Shopping Complex just five minutes walk from the entrance of the subdivision located at 83 Pyes Pa Road. You will find there a Super Value supermarket, restaurants, hot bread shop, pharmacy, gym, physio, beautician, hair salon, dentist, hearing centre, and the Pyes Pa Doctors. The Liz Van Welle Aquatic Centre has it's Swim School there. Close to arterial roads to other centres and Mount Maunganui. Near excellent primary schools - Greenpark zone, Tauriko. Walking/cycling distance to Aquinas College. Close to new private ACG School. School buses serve other colleges and Tauranga Intermediate School. Public bus service along Pyes Pa Road. 2 km to racecourse and two golf courses. TECT All Terrain Park 24km up Pyes Pa Road. By Pass for lower Pyes Pa Road from Route K reduces passing traffic. Major retail and industrial park located at Tauriko, 5 minutes drive away. A 71 hectare regional park is in the design stages. Located just south of Aquinas College it is being planned for sports, leisure and to host large events. Large family pool and adjacent 20m lap pool, open for an extended summer season and heated by 36 solar panels located on the pavilion roof. Library set up in a charming renovated cottage. Books have been donated by residents. The building is also used for community gatherings. Petanque court ('Boules' are in the locked box). Basketball hoop next to the library. All lot owners have a covenant on title requiring membership of the Twelve Acre Wood Residents Society and must pay a levy. Currently the levy is $90 per month payable monthly in advance. This is proving excellent value - it pays to share. The Society is responsible for maintenance of the facilities, parkland, street lighting and the private roads. The Twelve Acre Wood committee is elected annually. Rules and Regulations are available when required. All owners are covenanted on title to get approval for their house plans from the Design Committee prior to applying to Council for a Building Consent. Design Guidelines and Procedures are available when required. Residential A zoning - reticulated water, sewerage, storm water, electricity, gas, telephone, UFB, all vested in and maintained by the relative authorities.